On August 26, 2014 the New York Times ran a story about ATMs on the front page of the Business section. But the story was not about your run of the mill ATM found at banks and retail outlets around the country (and the world). This article was about Bitcoin ATMs. The New York Times story — “On To-Do List: Deposit Cash in Bitcoin ATM” — reported on the very first Bitcoin ATM in Manhattan. The device requires a leap of faith: a user deposits cash and gets… well, nothing. Nothing you can touch that is. In exchange for traditional currency the machine gives you bitcoin – ditigal currency trying to become the currency of the future. Digital currency that goes into your virtual Bitcoin wallet. The Bitcoin ATM illustrating the story is a small device sitting on a table. The user in one of the photos was activating a touch screen and holding his mobile phone up to the device. Once the user inserts cash, the device transfers code — oops, I mean digital currency — to the phone. The pictures accompanying the article worried me. From the looks of it, New York’s first Bitcoin ATM, developed by Bitcoin service provider PYC, was also a very inaccessible ATM. An ATM that violates the ADA and regulations issued by the United States Department of Justice. Read about the U.S. ATM accessibility regulations. Could it possibly be that fifteen years after the first Talking ATM was installed in the United States we’d be back to square one with inaccessible Bitcoin ATMs? Fortunately, it looks like at least one Bitcoin ATM manufacturer has possibly thought about accessibility. The GenesisCoin company website shows a Bitcoin ATM with a headset jack, braille label and tactile keypad. But does it talk so a blind person can use it? If a blind person plugs a headphone into that jack, will the software be there to walk her through the transaction? The company claims it has “built the most scalable, customizable, feature-rich Bitcoin ATM.” The website doesn’t mention accessibility as a feature. We won’t know if it is truly accessible until people with disabilities try it. 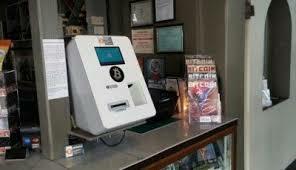 Advanced Commerce Solutions is another Bitcoin ATM manufacturer. It claims that “From sunny Tampa, FL our small company has been devoted to researching and designing the perfect ATM machine to buy and sell bitcoin from.” Hopefully ‘perfect’ includes accessibility and compliance with ADA regulations. All of these Bitcoin ATM manufacturers are working hard to convince retailers to purchase and install the new devices. In just fourteen days, and with a check of $14,500.00, anyone can get a Genesiscoin Bitcoin ATM installed. But merchants beware: If these devices are not accessible to customers with disabilities, the responsibility is yours. A Bitcoin ATM is an ATM that must be available to everyone, including people with disabilities. It must talk and have a tactile input mechanism, and a wheelchair rider must be able to reach the controls and view the screen. In short, a Bitcoin ATM must have all the features described in Section 707 of the Department of Justice’s ADA regulations. And the websites and applications that store the digital currency must meet accessibility standards. To most of us, bitcoin is a far away fantasy. But the infrastructure for the money of the future is being built today. That infrastructure – both the ATMs and all aspects on the digital side — must be accessible. The law requires it. Talking ATM settlements reached through Structured Negotiations. Articles about Talking ATM installations outside the United States can be found in the International News Category. This is a post about Bitcoin ATM. These are new ATMs that allow users to exchange cash for digital currency. People with disabilities must be able to use these new ATMs. They should be designed to meet legal standards under the ADA. Blind people should be able to operate the ATMs even though they cannot see information on the screen. People who use wheelchairs should be able to conduct all transactions.